In the late 900s, the Byzantine Emperor Basil (“the Bulgar Slayer”) led an army from Constantinople against the Bulgars who had invaded his territories in Greece. Defeated at first, he raised new armies and kept returning to the fray. The turning point finally came in 1014 when his imperial troops managed to capture fifteen thousand Bulgar warriors. Instead of killing his captives, he decided to blind them, except for one in every one hundred, whom he left with one eye each so that they could lead their comrades back home. One hundred and fifty eyes short of the blind leading the blind, the image of the mutilated Bulgars marching home, defeated, possesses an arresting, suggestive power. Those of us who attempt to know the past and claim that knowledge of it affords some guidance to the present might well identify with the one-eyed Bulgars: we see in part and we have a capacity to lead; but we recognize our defeats and limitations, the stubborn lacunae of what we cannot see and do not know. This awareness was driven home to me recently on a study trip abroad, in which I led several former students to Italy, to the cities of Orvieto, Florence, and Rome. Afterward, I continued traveling on my own to Istanbul, Turkey, the erstwhile “Nuova Roma” or Constantinople (330) until its sack by the Ottoman Turks in 1453, a red-letter date in world history. It was this latter, personal leg of the journey that prompted me to read up on the history of Istanbul, during which I encountered the curious story of Basil and the eyeless Bulgars. But for the theme of this essay—the imponderability of the past—the first part of the trip with the students and the solo one afterward must be understood together. For the study trip to Italy, we had selected as our topic: “Virtue and Vice: Explorations in History, Ethics, and Art, and Place,” a capacious set of foci, I admit. Our joint readings included Dante’s Purgatorio and some short works by the twentieth-century Thomist philosopher Josef Pieper, notably one of his classics, The Four Cardinal Virtues. In it, Pieper discusses the cardinal or classical virtues of Prudence, Justice, Courage, and Temperance, which first appear in Plato’s Republic. They were later baptized into Christian thought, most influentially in Thomas Aquinas’s Summa Theologiae, and subordinated to the New-Testament theological virtues of Faith, Hope, and Love. During our trip, we paired our readings with actual sightings of the virtues, frequently rendered as female allegorical figures in medieval and Renaissance art. They appear on the walls and ceilings of the Vatican museums, for example; in several places in fact, but most dramatically in Raphael’s stanza della segnatura, in the same room as his famous School of Athens. We discovered them often in Florence: on the doors of the Duomo’s Baptistery, on the side of the Duomo’s bell tower, at the Franciscan church of Santa Croce, in the Uffizi museum, and above the head of Thomas Aquinas in a provocative fresco, “The Triumph of Saint Thomas,” painted by Andrea di Bonaiuto da Firenze in the chapter room of the Santa Maria Novella, once the leading Dominican monastery in Florence. The iconography of the virtues fascinates. For the novice, Justice is the easiest to recognize among the cardinal virtues. She is usually associated with temporal power and fair treatment and portrayed (sometimes blindfolded) holding a sword and measuring scales. Fortitude or Courage, often depicted with a lion, usually wears armor and holds a mace or another weapon; she is prepared to die honorably for the good. By contrast, we found Temperance portrayed with a sheathed sword (the sheath symbolizing the limits of wrath), pouring a moderate amount of wine (a caution against drunkenness), or with a horse’s rein, suggesting the restraint necessary for the moral life. But the figure that I found most captivating was that of Prudence (prudentius), the virtue that is least understood today. It is also the virtue most relevant to thinking well about historical knowledge and its limits. Artists depict her in several ways. 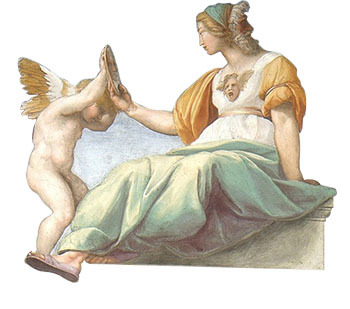 In Raphael’s stanze, seated between Temperance and Courage, she holds a mirror to herself, suggesting that the prudent person must possess accurate self-knowledge: know thyself. Often she holds a snake, an oblique reference to the Gospel of Matthew (10:16) where Christ admonished his disciples “to be as wise as serpents and as innocent as doves.” On the Baptistery doors in Florence, she is portrayed with a Janus face, one face looking forward, the other backward, suggesting that the wise person prepares for the future through memory and knowledge of the past. Perhaps if the Bulgars were better led against the Turks in 1014 by the “three-eyed one,” as Prudence is called in some translations of Dante, they would have retained their own eyes. But this only invites the question of exactly what prudence, understood as a three-eyed virtue, is supposed to mean, and what is its relevance to historical understanding? While in the Christian scheme of things, love (caritas, Agape) commands the place of highest honor, the virtue most exemplifying imitatio Christi, prudence possesses an indispensability all of its own. Thomas Aquinas insisted, for example, that all virtues, theological and cardinal, owed a special debt to prudence, because moral rectitude always depends on accurately sizing up reality, knowing the truth. Thomas even wrote, Omnis virtus moralis debet esse prudens (all virtue is necessarily prudent).2The achievement of good action always entails an unconfused, sobered-minded view of reality, an honest, probing “taking stock” of how the world and human nature are. For anyone trained in history, parts of this definition suggest a prescription for sound historical inquiry. “The humility of silence”: listening attentively to the past for every nuance and shade of meaning. “Unbiased understanding”: trying insofar as humanly possible not to let one’s own commitments and prejudices contaminate insight. “Memory’s faithfulness to being”: validating the importance of individual and collective memory in our constructions of the past. “The art of letting things speak for themselves”: bringing to life actual historical voices. And “alert composure before the unexpected”: readiness to alter or abandon one’s understanding of the past in light of new knowledge or countervailing evidence. But, once again, prudence is never divorced from action; it is meant to help one achieve a “definitive resolution,” to pursue the good actively. The three-eyed allegorical image bolsters this point: prudence scours memory and the past to assist an individual or a collective in the present, so that they might pursue a right and just course for the future. And yet—and yet. The question arises, given the distorting power of self-interest and the limitations of our knowledge, can one ever know enough, or know in the right manner, to make a wholly prudent decision? Is the fabric of human understanding more akin to the one-eyed Bulgars leading their blinded comrades home than the ebullient, dancing three-eyed lady in Dante’s Commedia? As Cicero observed in his On Duties, are not many circumstances in which we find ourselves “perplexingly difficult to assess” (Cicero, 165)? Or, to refer back to my title, are not many historical moments simply imponderable? The word imponderable and its kin “to ponder,” revealingly, are derived from the Middle English word, meaning to weigh (pondren), which we still have in the word “pound.” In this etymological light, are many constellations of historical events simply unweighable, impossible to make sense of fully, elusive in pointing moral actors in the present to a prudent course of action? Put in the language of the virtues themselves, how ought one prudently reckon with the limits of prudence, given that these limits are in fact very much a component of the complicated, lived human reality that prudence asks us to understand? Such questions tugged at my mind during my time abroad: in Italy, but even more pressingly in “New Rome,” today’s Istanbul. I had some knowledge of the Byzantine and Ottoman empires, to be sure, and of the secularizing reforms of Kemal Atatürk in the 1920s that established modern-day Turkey. But encountering, first-hand, the intoxicating complexity and otherness of Istanbul’s past, while inciting curiosity, left me, finally, with an unsettling feeling of disquiet. This disquiet crept over me while standing with Muslims at the tomb of Mehmet II (The Conquerer), the sultan who had sacked Constantinople in 1453. I sensed it again at the Mosque dedicated to Eyup Ensari, one of the companions of the Prophet Mohammed who had died in an attempted siege of Constantinople in the 670s. I felt it at the Hagia Sophia, once the grandest church in Christendom; at Topaki Palace, the home of the sultans until the eighteenth-century; at the Galata Bridge that crosses the Golden Horn into Boyoglu, the hip, Westernized part of the city. And I certainly felt it upon entering the city’s many Ottoman-era cemeteries, ubiquitous reminders of countless bygone lives, unknown and unknowable to most passersby. I suppose it was, finally, this unsettling feeling of bygoneness, of immenseirretrievability, that permeates the city and which I found arresting, worthy of reflection. The Turkish writer Orhan Pamuk connects this feeling with the Turkish notion of melancholy (hüzun) in his memoir, Istanbul: “No matter how ill-kept, no matter how neglected or hemmed in they are by [more recent] concrete monstrosities, the great mosques and other monuments of the city, as well as the lesser detritus of empire in every side street and corner—the little arches, fountains, and neighborhood mosques—inflict heartache on all who live among them” (101). Defeat is present too, at least for the historically attuned. For not only did the city nourish two of the world’s mightiest empires—the Byzantine and the Ottoman—but it also witnessed their demises, the Byzantine spectacularly in 1453, the Ottoman ignominiously as a consequence of World War I. “Defeat goes deeper into the human soul than victory,” writes the Arab historian Albert Hourani; “to be in someone else’s power is a conscious experience which induces doubts about the order of the universe, while those who have power can forget it, or can assume that it is part of the natural order of things or adopt ideas which justify their possession of it” (Hourani, 300). Like few other cities, Istanbul has known the surge of power and its evacuation. To be sure, the historian has many tools in her kit to reconstruct the past, to separate the important from the insignificant, to draw trenchant parallels between present and past. These tools should be used vigorously and with a high sense of purpose; the achievements of modern historiography, with its quest for firm evidence and objectivity, are galloping victories of the human spirit. But one must, finally, recognize their limits: a thick cloud of unknowing always accompanies the retrospective gaze. This reality places stark bounds on the acquisition of prudence. In his Summa Theologiae, Thomas Aquinas recognizes this. He divides prudence into three parts: 1) deliberation, the art of thinking well and bringing the relevant bits of particular knowledge, historical or otherwise, to the table; 2) judging well, making appropriate sense of deliberation, with an eye toward; 3) right action, deciding accurately and behaving well with a view to achieving the good. Among the many deterrents to prudence, Thomas lists ignorance and forgetfulness, the inaccessibility of the relevant past to the moral agent. Moreover, he also speaks of the “infinite variety” of particular facts that no human being or collective can possibly master and reflect well about “in a short span of time.” In pedestrian terms, prudence then is an art, not a science, a matter of probability, not certainty, a virtue of the mind suspended between the rich possibilities and stark ­limitations found in the “various and uncertain” aspects of human knowledge, historical or otherwise (Aquinas, 12–14). The nature of these limitations were exquisitely probed in an essay from the nineteenth century entitled, straightforwardly enough, “On the Limitations of Historical Knowledge” by the now-forgotten Swiss scholar Wilhelm Vischer, a colleague of Friedrich Nietzsche at the University of Basel. Originally delivered as an academic address, Vischer attributed great importance to the rise of modern historiography in the context of the German university system, then the envy of the world. But, as the title suggests, he sought to remind his fellow historians of the “fixed and unalterable” limitations placed on knowing the past. Historical knowledge “can never be total,” he proclaimed; “it will necessarily contain gaps, and in order to fill these gaps... we shall be obliged to resort to a connecting activity of our understanding or to the observations of others, most frequently both at once.” Daily lived experience, he continued, points out the elusiveness of ascertaining what actually happened: “much that we remember slips out of sequence and becomes unmoored from its original relations, and the unceasing activity of the understanding and imagination will create ever new images out of the remains of our observations, imperfectly retained as they will have been in our memory, and none of these will be exactly identical with the image we had just a moment earlier. Such is the uncertainty even of that source which comes to us from our [own] observations and experiences” (Gossman, 41). Plumbing the experience of people remote in time from ours is thus all the harder. “The uncertainty is increased in proportion as the observations we have to work with are less immediate... Two accounts of the same [past] event, even by the most reliable witnesses, will never completely coincide, they will always differ from each other, at one point or another, more or less considerably, and not necessarily only in the inessentials. But quite often the witness is actually unreliable. And the very question whether he is or not, which is the first question we must answer, can be an exceedingly difficult one that will be resolved by one historian in one way and by another historian in another.” And when it comes finally to writing and publishing history, Vischer sighs, “how many are the distortions...produced by ignorance and lack of understanding, preconceived ideas, or the partisan intentions of editors” (Gossman, 42). Goading those positivists in the nineteenth century who wanted to turn history into an “exact science,” Vischer avers that our knowledge of the past will always be “distorting” and “fragmentary.” “In the realm of historical knowledge no absolute certainty can ever be attained, that all we can ever reach is probability, and that even facts which we are accustomed to accept as absolutely certain and reliable rest only on the testimony of human beings who are intellectually and morally imperfect and subject to error.” In fact, history is sufficiently distant from science, he concludes, that we might do better to consider it akin to poetry: “History cannot immediately reproduce facts in their naked reality or integrality. It can evoke the image which impressed itself on the mind of the participant or the observer and to which he gave expression—not directly, but through a process of conscious or unconscious poetic creation, through art. Thus every historical narrative—even those that are relatively most reliably and most immediate—falls into the category of poetry” (Gossman, 49). Perhaps Vischer overplays his hand here, for there are good reasons to regard history and poetry as distinct enterprises. But by expressing the quandary of the historical knower in this manner, Vischer fortuitously points us toward some ancient reflections offered by Aristotle. In his Poetics, Aristotle opined that “the difference between a poet and a historian is this: the historian relates what has happened, the poet what could happen. Therefore, poetry is something more philosophic and of more serious import than history; for poetry tends to deal with the general, while history is concerned with delimited particular facts” (Aristotle, 18). These sentences have furrowed the brows of historians for centuries. But risking the charge of heresy from my guild, I think Aristotle is on to something. Often the pursuit of “delimited particular facts,” as Aristotle calls them, takes on an exaggerated life of its own, to the exclusion of more general, properly basic human modes of inquiry that we might associate with poetry and philosophy. And I am not talking about the academic “fields” of “creative writing” or “analytic philosophy,” but something at once more common and marvelous. If I may return to Josef Pieper, I refer to what Pieper, quoting the pre-Socratic philosopher Heraclitus, called, “listening to the essence of things,” allowing Being, in its manifold complexity and as phenomenologically immediate to the individual person, to impress itself passively on consciousness. The “capacity of simplex intuitus,” simply intuiting or understanding, observes Pieper, is one of the most irreducibly human acts. Distinguishing between the medieval terms ratio and intellectus, Pieper associates the poetic and the philosophical, with the latter, not the former. The former, ratio, is “the power of discursive, logical thought, of searching and examination, of abstraction, of definition and drawing conclusions.” Sound historical inquiry would proceed along these lines, and rightly it should. But if unwarrantedly absolutized, it would deflect the understanding from intellectus, a more passive, receptive, and I would add, elusive, form of understanding in which Being “offers itself like a landscape to the eye” (Pieper 1952, 9). Historical scholarship requires ratio; contemplating the past as an aspect of Being—and contemplating oneself contemplating it—­suggests intellectus: taking in, beholding, ruminating, pondering. In our (post)modern times, it is difficult to make fumbling references to “Being,” as I am guilty of doing, without reference to the ponderous legacy of the philosopher Martin Heidegger. Let me make that reference explicit, then, by drawing from Heidegger himself and one of his intellectual heroes (and mine), Blaise Pascal. Together, they help us think well about the ­limitations of historical knowing and its bearing on consciousness, what I take to be an implicit element in Heidegger’s 1927 opus Sein und Zeit (Being and Time) and in Pascal’s wonder and dread at the “eternal silences” of time and space that encompass and impinge upon the searching mind. Admittedly, it is often not time, but nature, especially the sublime in nature written of with such rhapsodic eloquence by Edmund Burke and Immanuel Kant, that triggers the big philosophical questions, the keep-you-awake-at-night unfathomables about the immensity, terror, and beauty of it “all.” This is especially true perhaps of one of the grandest questions ever posed: Leibniz’s “why is there something rather than nothing?” But as Heiddegger recognized, it can just as readily be time, Zeit, that can induce the untethered, sleepless moments. Why am I here, seemingly thrown (geworfen) here, in this particular place and time, instead of another place and time, instead of no-place and no-time? It is this reality, the strange dialectic between what the scholastic philosophers called the “quiddity” (the this-ness) of the time-space-bound self and the zero-sum alternative of non-existence, that lies, I think, at the heart of Heidegger’s Seinsfrage, his question about Being, his rapturous, circuitous, often impenetrable interrogation of what (and why?) it is to be and the relationship between individuals beings and that agonized-after Northwest Passage of Heidegger’s mind: Being (Sein). George Steiner, one of the more incisive commentators on Heidegger, has nicely summarized Heidegger’s pursuit. “For the greatest majority of human beings,” he writes, such questioning of the very foundations of Being looms “in moments of great despair, when things tend to lose all their weight and all meaning becomes obscured.” “Or it can be experienced in flashes of vital brilliance, when sensory discrimination pierces the skin of things [the sublime?] But in most cases the question ‘will strike like a muffled bell that rings into our life and gradually dies away.’ For Heidegger, however, it is the one and only interrogation, the incessant asking without which there can be neither a proper humanity, nor a coherent mode of individual or social existence, nor any philosophy worthy of its name” (Steiner, 35). The historian is properly preoccupied with “particular delimited facts,” as Aristotle noted, and with them valuable assistance is offered in general understanding and in the acquisition of prudence. But as a human being, the historian, like few fellow inquirers, sits astride and busies herself with time, Zeit—the vast, multi-subjective chain and conglomerate of human experience—some recoverable, but most unfathomable, buried in a perpetually receding, inaccessible sludge of anonymity. If the historian aspires to be a human being and not merely a historian, she should sometimes—perhaps often—lift her spade from the particular and delimited (acquired through ratio) to the general and expansive (a matter of intellectus), from “the times” to the mystery of time, and from then—as Heidegger would have it—on to being: from Zeit to Sein. Reflecting on the limits of our knowledge, the imponderability of the past, suggests itself as a good place to begin. Heidegger sometimes kept a picture of Pascal on his wall. For the Christian and religiously-inclined mind, Pascal’s stance toward Being might hold yet more resonance. For Pascal connects the question of Being to the question of God in a way that Heidegger felt impossible, or at least terminally inconclusive, after the so-called “Death of God” in the twentieth century. But what for Heidegger was inconclusive, we might retain as possible—­difficult, to be sure, under the cultural conditions of late modernity—but glimpsible under the guideposts of those higher virtues: faith, hope, and love. Writing after the Copernican revolution in astronomy, Pascal was among the first to muse on the infinitesimally small place of human beings in the cosmos and the challenges this posed for religious assent. We find ourselves, he wrote, “lost in this corner of the universe”; “the whole visible world is only an imperceptible dot in nature’s amble bosom. No idea comes near it; it is no good inflating our conceptions beyond imaginable space, we only bring forth atoms compared to the reality of things.” And as he most famously observed: “The eternal silence of these infinite spaces fills me with dread” (Pascal, 59, 66). The dialectic of rapture and terror that shouted at Pascal from nature also whispered to him from his experience of time. He was captivated by how historical contingencies produced events that led to other events and, in turn, to other events, and so. If Cleopatra’s nose had been smaller, he famously mused, the history of the world might have turned out differently, for Julius Caesar and Mark Antony might not have fallen in love with her. “Cleopatra’s nose” became for him a shorthand expression to convey the phenomenological experience of time as a fast-moving accretion of seemingly fathomless contingencies. Sometimes Pascal’s reflections on time merge with self-reflection on the brevity of life. “When I consider the brief span of my life absorbed into the eternity which comes before and after—as the remembrance of a guest that tarrieth but a day3—the small space I occupy and which I see swallowed up in the infinite immensity..., of which I know nothing and which knows nothing of me, I take fright and am amazed to see myself here rather than there: there is no reason for me to be here rather than there, now rather than then. Who put me here? By whose command and act were this time and place allotted to me” (19)? In the course of a life, Pascal felt that human beings were at once “incapable of certain knowledge or [of] absolute ignorance.” We long to know, to gain wisdom and comprehension. But “nothing stands still for us,” he continued; “We burn with desire to find a firm footing, an ultimate, lasting base on which to build a tower rising to infinity, but our whole foundation cracks and the earth opens up in the depth of the abyss” (63). The yawning gulf of time envelops us; we strain to see, but our vision often blurs. A melancholy pathos shrouds a lone traveler in a large metropolis, especially one of great historical significance. I could not shake this feeling while in Istanbul. On my last night in the city, I walked out on the Galata Bridge across the Golden Horn, which separates the Sultanamet district of the city (once the home of the sultans) from Boyoglu (where Genoese and Venetian merchants once set up shop). Few spots rival this one as a place to size up some of the deeper currents of world history. One can see the Hagia Sophia in all its resplendent night-time glory, the church of one empire, the mosque of another, before becoming in the 1930s a museum, perhaps the most telling institution of modernity. From the bridge, one can glance out over the Bosophorus, the narrow passage of water that separates Europe from Asia; who controlled this passage controlled the destiny of millions. One can look up the Golden Horn toward the Fatih district, where the Patriarch of Constantinople, the worldwide leader of Orthodox Christians, resides, now behind guarded walls and the thick presence of Turkish police. One can look southwest from the bridge and see the Suleymaniye, the massive mosque built by Suleiman the Magnificent, the most powerful sultan of the Ottoman Empire and one of the most dominant rulers in world history. Had his forces sacked Vienna in 1529, how would we read history today? We arrive back at Cleopatra’s nose. Beneath the sprawl of modern Istanbul and beneath the Ottoman legacy lies, of course, the memory of the Byzantine Empire, which ceased to exist on May 29, 1453. You can tell the perspective of the person you are talking to, Orhan Pamuk once observed, if they refer to this event as the Fall of Constantinople or the Conquest of Istanbul. Different narratives of this event and centuries-old accumulations of rival interpretations lend credence to either phrase. And if one digs back a little further, you will arrive, as I did, at the story of the Byzantine Emperor Basil, “the Bulgar Slayer,” and the ghoulish train of maimed Bulgars that he vanquished. For reasons not entirely clear to me, this image became to me a placeholder for the immensity and irretrievability of the past and for our limitations in encountering it. The study of history is a magnificent thing and there is much we can and ought to know. More precisely, penetrating knowledge of the past helps in the acquisition of prudence, that searching knowledge oriented toward foresight and virtuous action. At the same time, it would be arrogant—and therefore imprudent—to believe that the past can be “mastered,” definitively pinned down, encountered only in the spirit of ratio, discursive and analytic reasoning. The past also ought to awaken in us intellectus, a passive, more ruminative, poetic disposition of mind that enlarges the imagination in the very act of humbling it. Through intellectus, the manifold artifacts, beauty, and inscrutability of the past enable us to better “know thyself” by allowing us to see ourselves, in words of the poet Billy Collins, “stand[ing] in the tremble of thought / taking the vast outside into ourselves.” Or, in biblical language, it nudges us toward that “firm footing” that Pascal ardently desired, but only insofar as it helps us recognize that we know only in part, that we see in a glass darkly. This essay is dedicated to Mark Schwehn, dear friend and mentor. Thomas Albert (Tal) Howard directs the Center for Faith and Inquiry and is Professor of History at Gordon College in Wenham, Massachusetts. He is the author of God and the Atlantic: America, Europe, and the Religious Divide (Oxford, 2011). Aquinas, Thomas. The Cardinal Virtues. Richard J. Regan, trans and ed. Indianapolis: Hackett Publishing. Aristotle. The Poetics of Aristotle. Preston H. Epps, trans. Chapel Hill: The University of North Carolina Press, 1942. Cicero. Selected Works. Michael Grant, trans. New York: Penguin Books, 1971. Dante. Divine Comedy: Purgatorio. Jean and Robert Hollander, trans. New York: Anchor Books, 2003. Gossman, Lionel. “The Boundaries of the City: A Nineteenth-Century Essay on ‘The Limits of Historical Knowledge’ [by Wilhelm Vischer].” History and Theory, Vol. 25 (2001): 41–49. Pamuk, Orhan. Istanbul: Memories and the City. Maureen Freely, trans. New York: Vintage Books, 2004. Pascal, Blaise. Pensées. A. J. Krailsheimer, trans. Revised Edition. New York: Penguin Books, 1995. Pieper, Josef. Kleines Lesebuch von den Tugenden des menschlichen Herzens. Ostfildern: Schwabenverlag, 1988. _____. Leisure: The Basis of Culture. Alexander Dru, trans. Indianapolis: Liberty Fund, 1952. Steiner, George. Martin Heidegger. New York: Viking Press, 1978. 1.The following few paragraphs draw from material that I treated in Thomas Albert Howard, “Virtue Ethics and Historical Inquiry: The Case of Prudence,” in John Fea, Jay Green, and Eric Miller, eds., Confessing History: Explorations in Christian Faith and the Historian’s Vocation (Notre Dame: University of Notre Dame Press, 2010). 2.On the importance of prudence in the thought of Thomas Aquinas, see Daniel Mark Nelson, The Priority of Prudence: Virtue and Natural Law in Thomas Aquinas and the Implications for Modern Ethics (University Park, Pa.: Pennsylvania University Press, 1992). 3.This is reference to the Book of Wisdom, verse 15.